I'm sure you've heard of social smokers. Well, I'm a social smartphone user. I'm a cheerful Luddite with my battered Nokia and my big pink Kikki K diary, happy to stare out the window on trains or at spunky waiters when my dining buddy goes to the loo. But it's all a charade, dear readers. My family and friends know the texts well: "I'm so sorry to bother, but could you look up where the nearest ATM is for me?" "Hey, would you mind checking when the next train is? Sorry to be annoying!" Annoying is right! And like smokers who go out with ciggies but never a lighter, I have a terrible habit of heading off without my standard dodgy map scrawled on the back of an envelope and then ringing up some poor mate who was probably quietly caressing their Twitter feed with "um, I'm really sorry, but do you mind looking up where Wonderbao is? I think I am lost." Well, it was the typical story when I drove off merrily to find Newport's new Flock with nothing but the notion that "I'm sure I'll stumble across it - Newport isn't that big". Well, no. 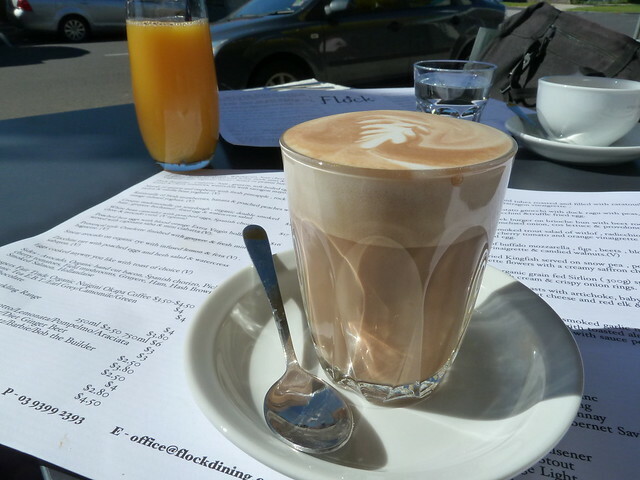 This brand-new, Frenchy cafe is really tucked away in the backstreets, quite far from the well-known strip around the station. It has a great sense of poise from the moment you walk in, from the soothing pale walls to the eponymous flock suspended above the room. The menu is a pleasure to read. 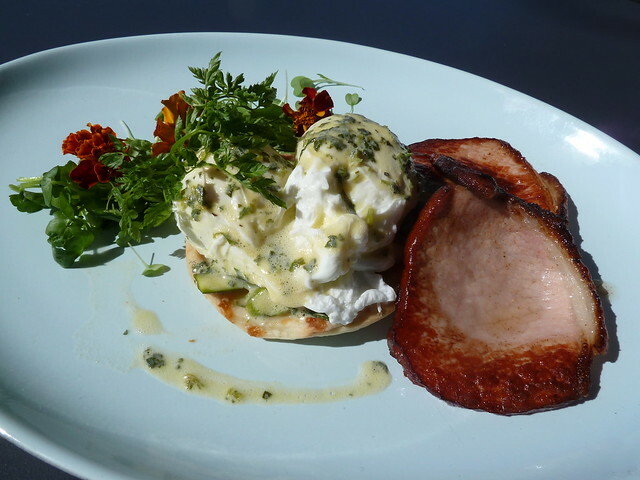 Poached hen eggs with blood orange hollandaise (the rooster had stopped laying, quipped the gent who served us - but in fact it's a nod to the French notion that eggs on the menu could equally be from quail, geese or ducks as well as the common chook). Croque mademoiselle with double-smoked ham... Espresso butter on sour cherry raisin bread... Even a "ratatouille" of bananas, strawberries and peaches! Coffee is by Jasper and was very good. Aww! It's like two eggs in a nest! These glossy googs oozed perfectly over the tart beneath, lined with tiny zucchini barely two inches long. I loved the baby zukes, cooked til al dente with perhaps a little vinegar, but I found the pastry shell quite hard - I was expecting something softer and more flaky. 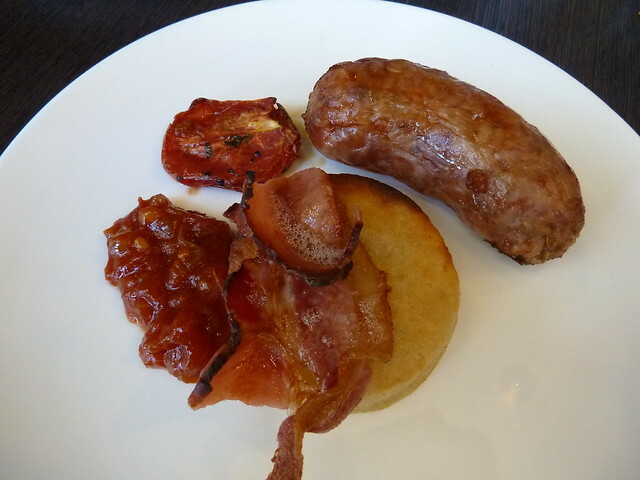 Loved the organic bacon, cut satisfyingly thick... I'm glad I ordered it as the dish might have been a touch small otherwise. But as my friend M said to me recently - "You eat much more than most girls I know." Thanks, I think? This one really hit the spot, with braised white beans, lovely paprika-rich chorizo and a big squiggle of soft avocado puree. Lunch at Flock is similarly French infused. I've got my eye on a house-smoked trout salad with witlof, chervil and pickled cherry tomato. There are kids' options which are remarkably well priced, $8.50 for mini minute steak with chips, green beans or salad, or gnocchi with Napoli sauce. 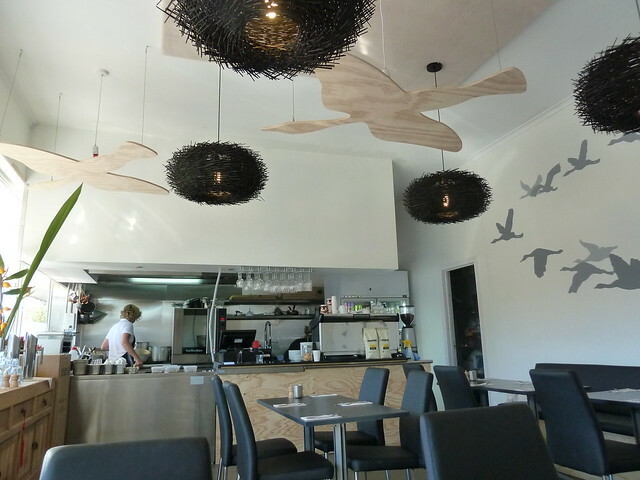 Check out their website for their lunch and dinner menus - they're open Wed-Sat evenings as well. 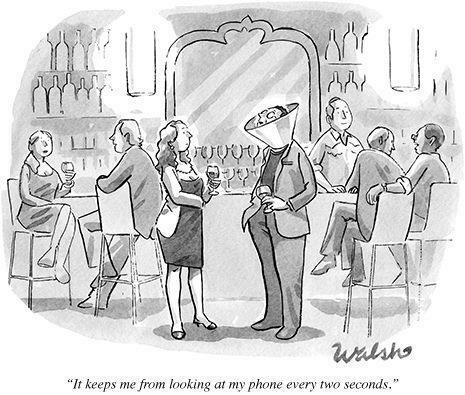 As for my social smartphone habit? As we speak, I have a brand new phone sitting in a box on my shelf. I'm just waiting for my existing credit to run out before I join the zombie legion of screen-stroking smartphone users. And while I know my friends will be thankful, I am sure I'll love every minute of it too! 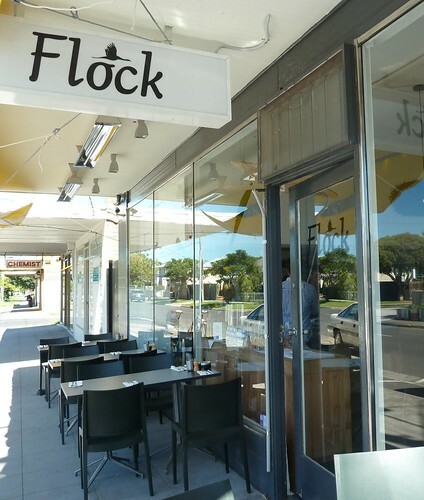 PS: Read more about Flock at Milk Bar Mag. Thanks for the tip! 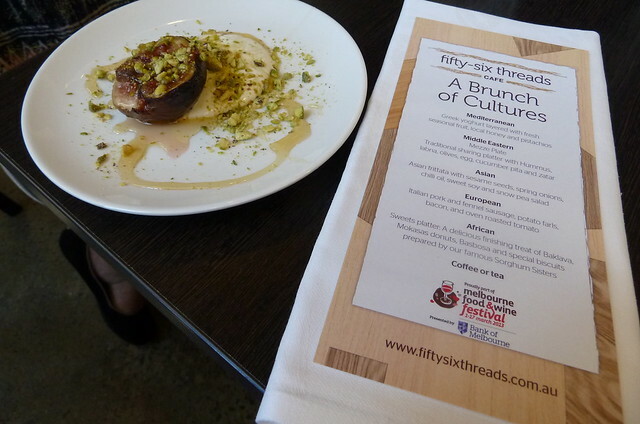 I was invited to attend fifty-six threads' Melbourne Food and Wine Festival event, "A Brunch of Cultures", as a non-paying guest. See end of post for full disclosure. From the outside, my friend's Mazda was travelling at a sedate 50 kmh up Kensington Road, but inside she was fanging it. Due to numerous babysitting stuff-ups, we thought we were going to be late for this epic five-course brunch, but as we approached I knew we were making good time. "Turn here," I said when we got to Derby Street and a few seconds later, "Pull over there - here we are!" She braked and looked around. "Are you sure?" fifty-six threads may have an unlikely location at the bottom of a Housing Commission block, but it's all part of the story behind this unique social enterprise. It is run by AMES who provide humanitarian settlement services, English language teaching and work placement. Their mission is "full participation for all in a cohesive and diverse society". I liked them already, and I hadn't even tried their food yet! In fact, I have had a long relationship with AMES. My mum used to volunteer teaching English to migrants through their home tutor program and I started doing the same in my early 20s. 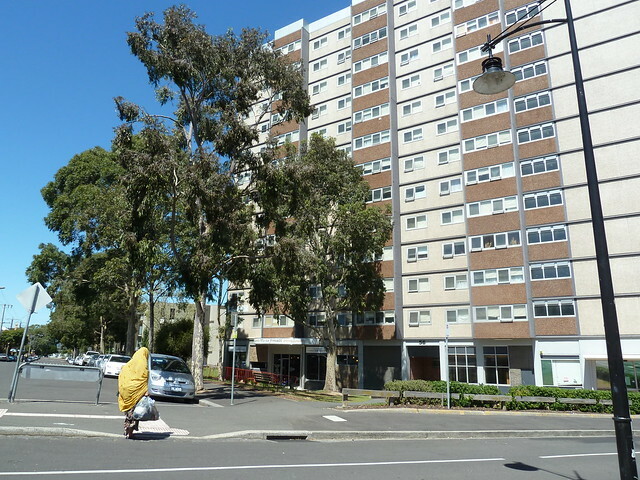 I still remember my first student, Thuy, who lived in the Richmond flats and who would make me awesome Vietnamese food after every lesson. Over the ensuing years I had more lovely students from Sudan and Lebanon and somehow always managed to wrangle a delicious, home-cooked meal after every class. What a scammer! 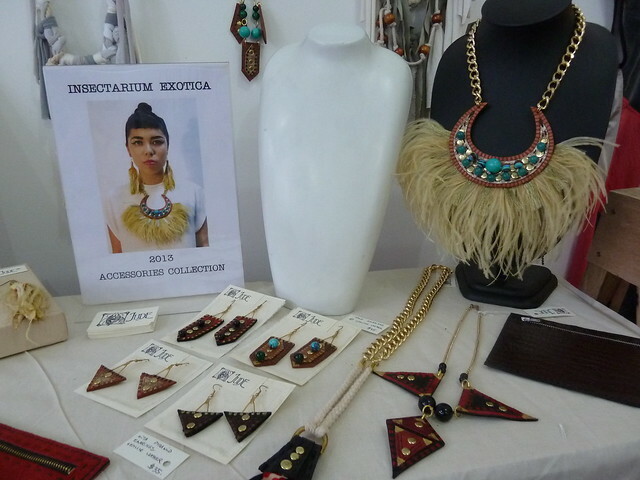 fifty-six threads has been open for just over 12 months. It has been staffed and run like a regular business for this opening phase and now that good systems are in place, it's about to move into its next phase as a training ground for AMES clients including work experience, vocational training courses and work placement opportunities. 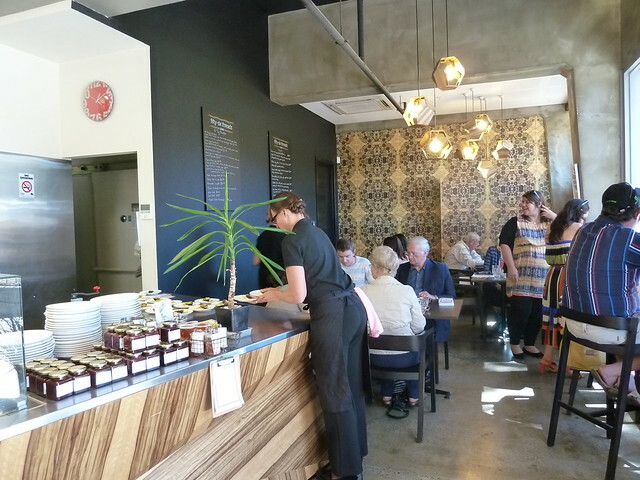 The cafe is also part of the larger Kensington redevelopment project which has seen new public and private homes built around the existing Commission flats in an attempt to integrate the estate both physically and socially into the surrounding area and create a vibrant, connected community. I feel that food, coffee and restaurant culture are powerful tools that can be used for good. Menus can set the bar for us at home by raising awareness of ethical, local produce. The Cup of Excellence provides real incentives for Third World producers to produce stellar coffee, with accompanying monetary returns far above those which even Fair Trade certification would offer. 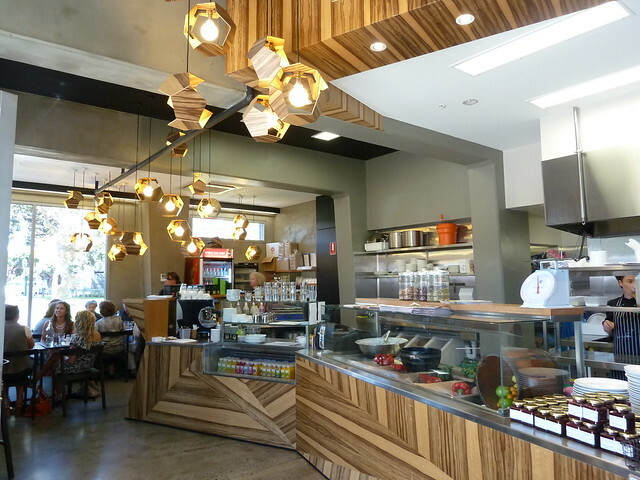 Cafes and restaurants can also give back to the community through not-for-profit or charitable initiatives such as at Kinfolk or training as through Scarf. If you believe in an equitable, diverse Melbourne community, dining at fifty-six threads is putting your money where your mouth is. Anyway, enough proselytising - onto the food! Course number one was a gorgeous, warmed seasonal fig with creamy Greek yoghurt, pistachios and honey. Just divine. 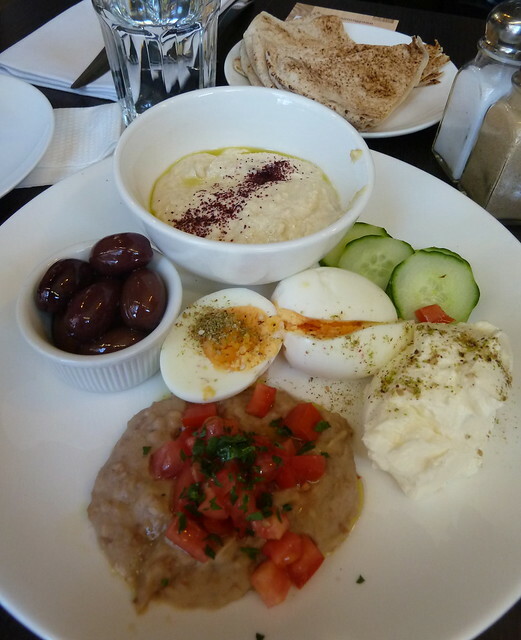 We then dove into a Middle Eastern mezze platter with really good olives, thick tangy labne, ful (mashed dried broad beans), pita, boiled egg and more. Delicious and healthy! Perhaps the hummus could have been more zesty, but if you thought I'm a coffee snob, I'm an even worse hummus one. 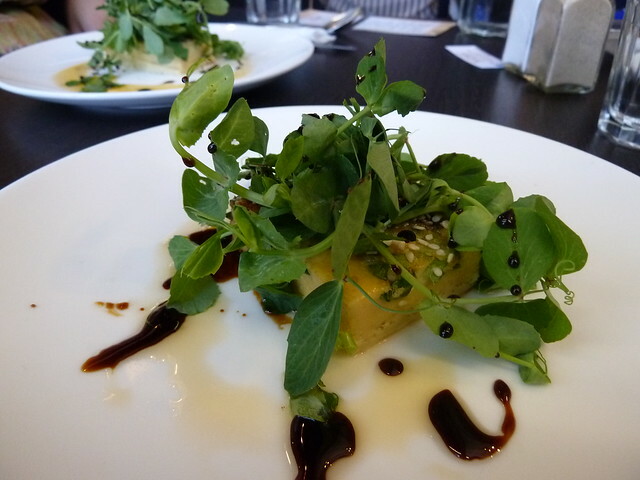 I loved this dish - an "Asian frittata" with snow pea shoots and sweet soy. The eggy slice was silky and moreish, lovely with a quick swipe through the kecap manis-like sauce. The snow pea shoots are so typical of that fantastic Asian tendency to use everything - not just the fruit, but the leaves, stalks and roots as well. 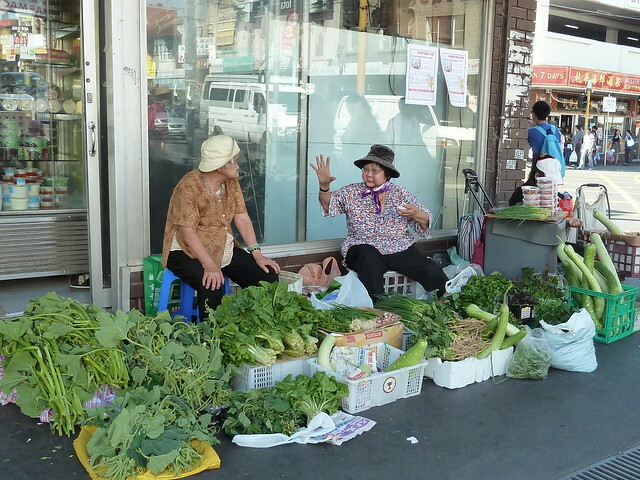 I've even seen chilli and melon leaves and stems for sale in Little Saigon - nothing is chucked out. Last savoury course - a statuesque pork and fennel sausage and wickedly good bacon, both from venerable Carlton butcher Donati's. They cuddled up next to a potato farl which I believe is Irish potato bread that has been fried - a bit like a giant potato cake! I believe that fifty-six threads are moving to source all their meat from Donati's in the future. AMES' first social enterprise was the Sorghum Sisters. The "sisters" in question were a group of refugee women from the Horn of Africa who came up with their own catering business. 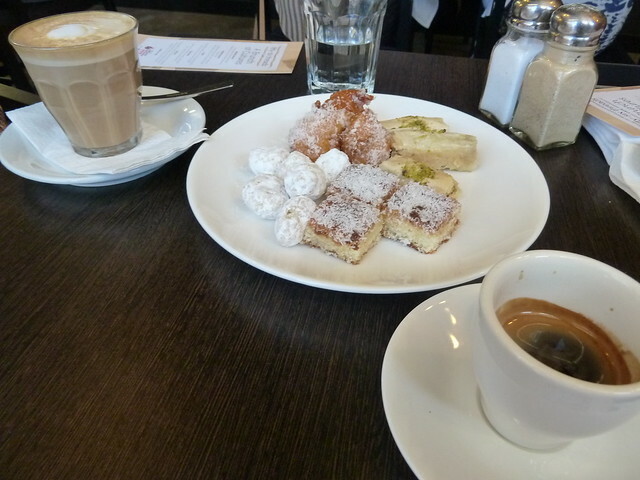 From these clever cookies came this selection of baklava, basbosa coconut slice, bikkies and honey-draped donuts. fifty-six threads use coffee from fellow social enterprise STREAT, also in Kensington. My espresso was great, although I must say I popped in the week before and another short black then was really not good. On that visit I didn't hear the tell-tale buzz of the grinder before the espresso was made. I wonder if the grinder's hopper might have been full from a previous grind - to get the full flavour profile, coffee really needs to be extracted from beans ground to order, just seconds before pulling the shot. Still, the short black this day was on the money. I have such fond memories of working with AMES, and I'm happy to know they are still working hard to make the path of settlement a little easier. 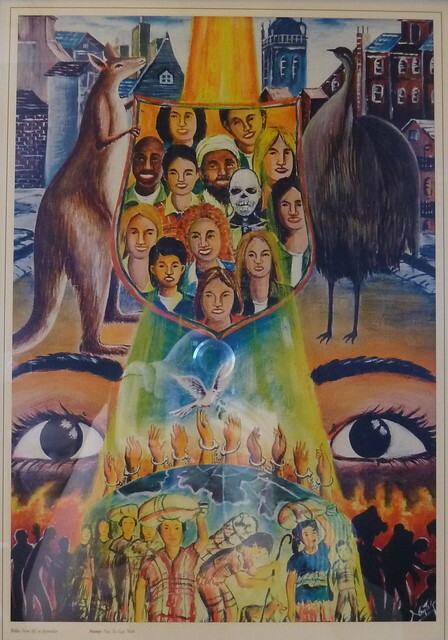 This mesmerising image is called "New Life in Australia" and is by Nay Ta Gay Wah, an entrant in AMES' annual refugee fine art prize, Heartlands. I encourage you to look through the past winners, whose stories are both heartbreaking and heartening. 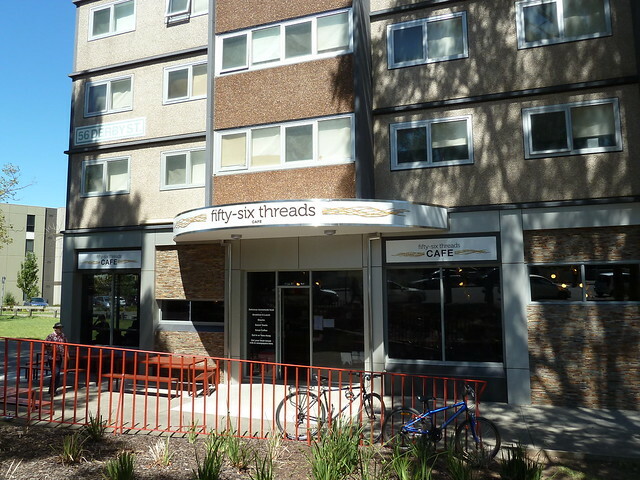 fifty-six threads' name is inspired by the many threads of the community weaving their stories, skills and passions through the cafe. I love this vision of Australia - a beautiful tapestry of talents and tales from all around the globe. Disclosure: AMES invited me and a guest to join the senior communications coordinator of AMES at AMES' 2013 Melbourne Food and Wine Festival event, "A Brunch of Cultures". Attendance was not conditional on writing a subsequent post. Neither AMES nor fifty-six threads have sought nor been given any editorial control of this post. I think I'm the only person in Melbourne who wants this heat wave to continue. Reason being, I dragged my skinny jeans out of the cupboard the other day and hoo boy - less muffin top and more mushroom cloud! As long as these days keep being sunny, I can stuff those pants at the back of the cupboard and keep swanning about in forgiving summer frocks. As you may know, the Food Festival is upon us and it's been worth every popped button so far. 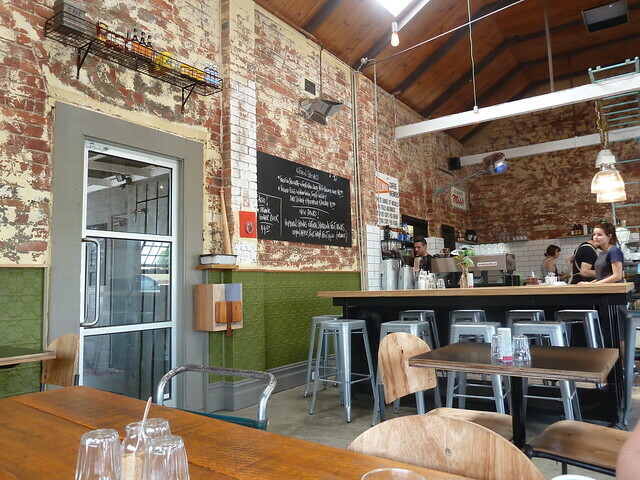 I want to share with you some of the brilliant events I've been to in the western suburbs, but first it's time to clear the decks with a smattering of tasty treats. My first amnesty post was here, and I hope you enjoy another! 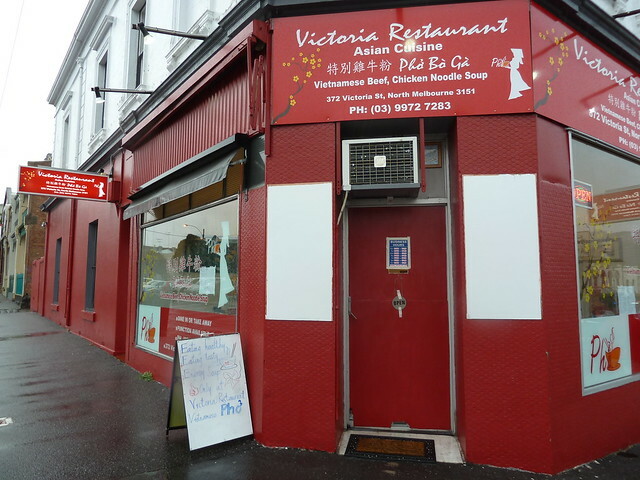 I'm not sure if this festive red shop, Victoria Restaurant in North Melbourne, is new but one dish on the menu piqued my interest when wandering past. 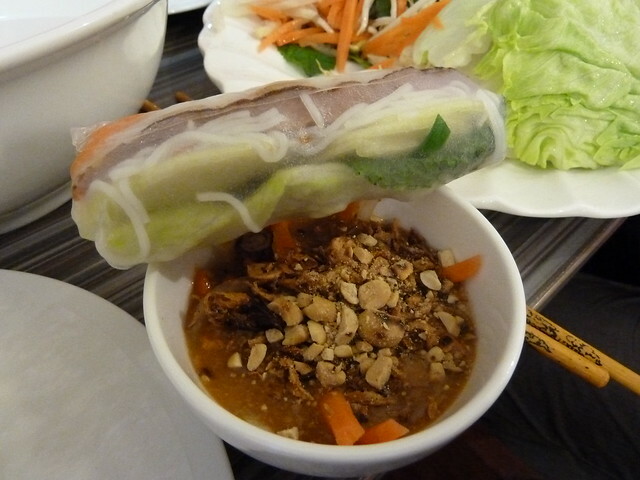 These are do-it-yourself Nha Trang-style rice paper rolls. 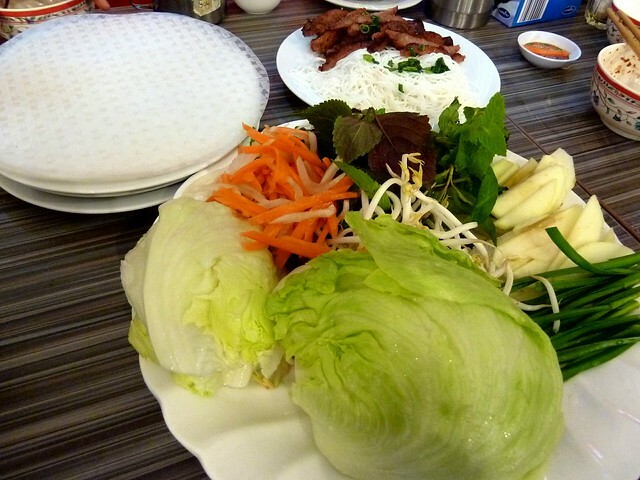 Lengths of grilled nem nuong or minced pork patty, smoky and juicy, are supplied along with pickled carrots, vermicelli, mints and cooling sliced apple - an interesting and delicious touch! You twirl the round rice paper wrapper through hot water, fill it how you like, roll it up and dunk in special, curiously orange Nha Trang-style sauce. Quan Viet also make Nha Trang-style rice paper rolls with this same sauce - I know it contains pork, but that's the extent of my knowledge! 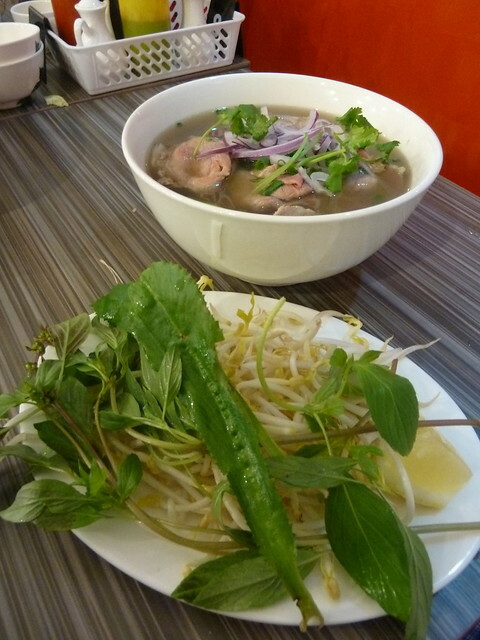 Victoria Restaurant also do pho, and are the first place I've ever seen in Melbourne that serves sawtooth coriander alongside the regulation Thai basil! In terms of our other dishes, some were perhaps a little Anglicised - spring rolls came with sweet chilli, not nuoc mam cham - and I think they were unexpectedly busy as the last of our dishes didn't arrive until about 90 minutes after ordering. I only had a sip of this pho but I'd like to go back and try it again. 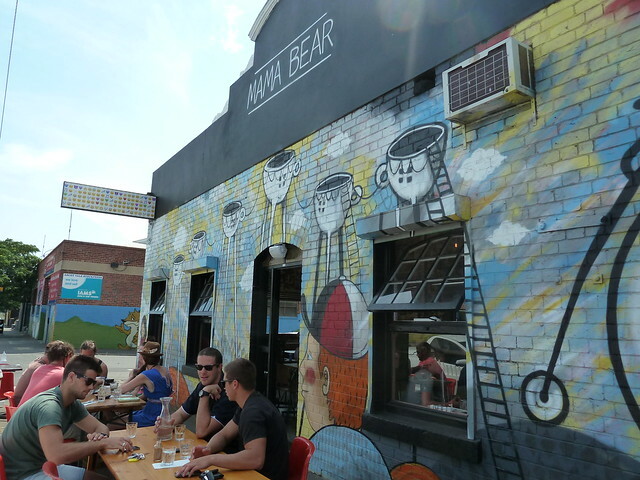 Mama Bear is a new brunch spot that's popped up in this cafe blackspot, not far from Flemington Racecourse. Their house brew is Gridlock's 7,000 blend, plus there are single origins. A latte and a single origin short black were respectable, perhaps not as sublime as Common Galaxia or Wee Jeanie but good all the same. There are loads of enticing menu options like eggs with apple cider hollandaise and slow-cooked beef cheek sliders. 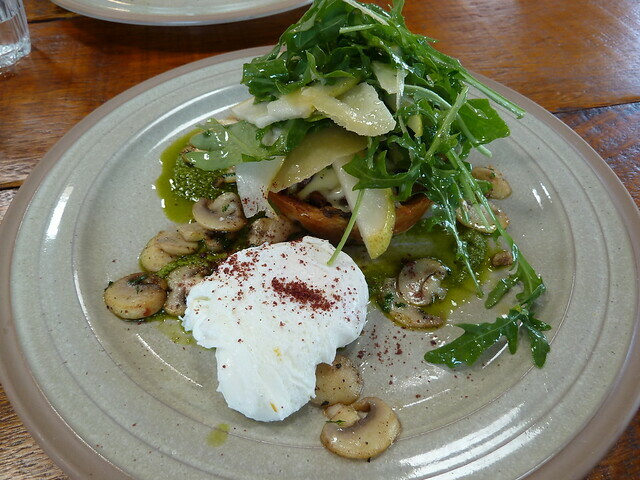 I settled on this wild mushroom and taleggio tart with a pear and rocket salad, which was delish. 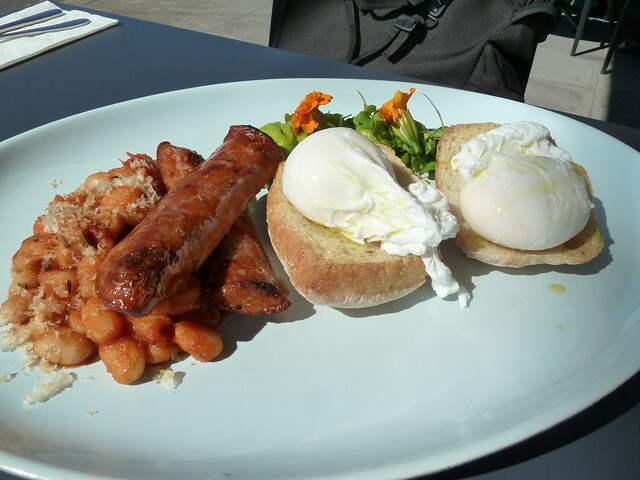 And for you fuss pots, there is an actual menu item called "I just want some eggs". Love it! From one mama to another... 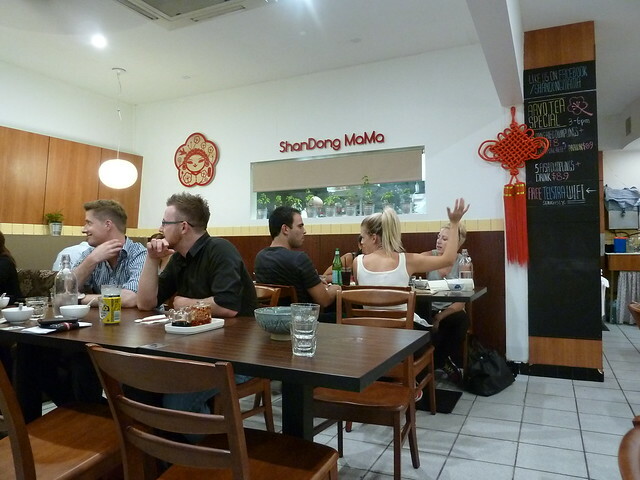 There's probably nothing Melbourne likes more than a new dumpling house, and consequently Shandong Mama is getting epic amounts of buzz. It is actually run by a mama from Shandong, and staffed by many gorgeous family members (we were served by her delightful son-in-law). I mean, if that video doesn't make you scream and run around the room, you're not really a Melburnian. So when I visited, to quote a friend who'd been a few nights earlier, I was expecting the second coming. And therein probably lay the problem. I think I'm the lone dissenter in all the hype in that Shandong Mama didn't blow my mind. 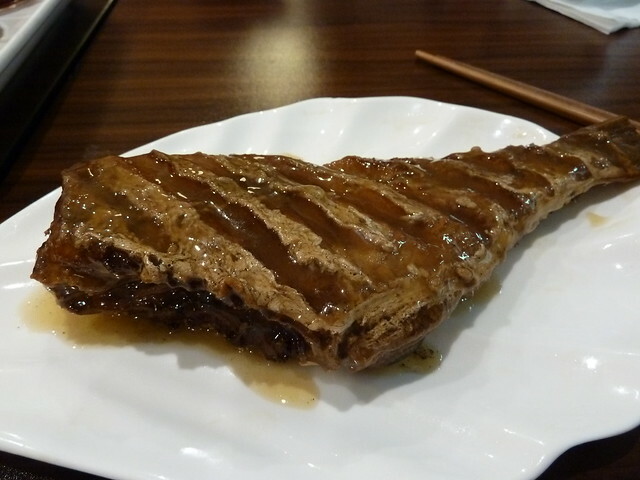 My impression is that it is really, really authentic, but out of the entire Asian gastronomic pantheon, I find northern Chinese dishes such as these the most difficult. 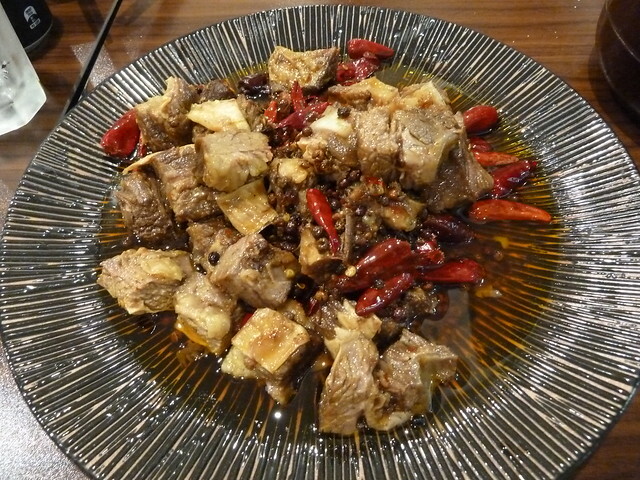 This "Sichuan pepper beef" was too much for me, the pieces very fatty and gelatinous. Likewise I couldn't handle this homemade smoked fish, served cold with a thick, gooey sauce. 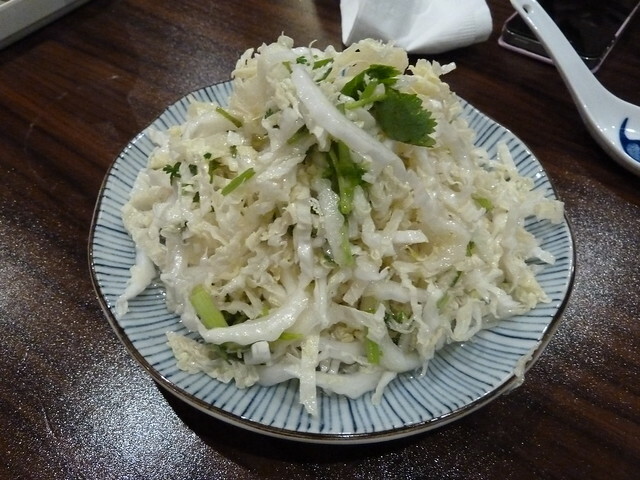 I did really like this lovely, sweet cabbage salad (an authentic version of Chang's!) but an accompanying black fungus and sesame oil salad, with big sheathes of swollen, slightly rubbery black vegetable, didn't go down well with me. The dumplings were good but they just didn't reach the dizzying heights I was expecting. We tried quite a few varieties and my favourite were probably these "Melbourne dumplings", a tasty mix of seafood, chicken, lemon zest, olive oil and parsley. I must add that they had run out of so many dishes, ordering became somewhat farcical (a friend confirmed this too on another visit). So it's back to Shanghai Street for me. 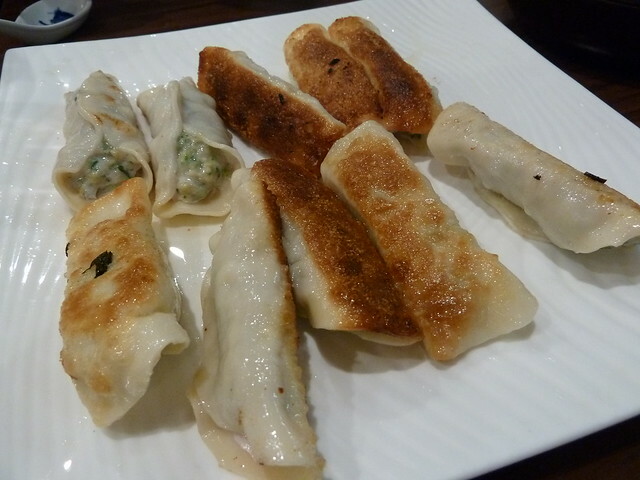 But try Shandong Mama for yourself and see what you think! But whatever you do, DO believe the hype at city lunch joint Wonderbao. Check out this great interview by Eat & Greet with funky young owner Andrew Wong - his fam had been making steamed buns in Braybrook for years before Andrew commandeered the family recipes, booted out the MSG and created an instant Melbourne classic. 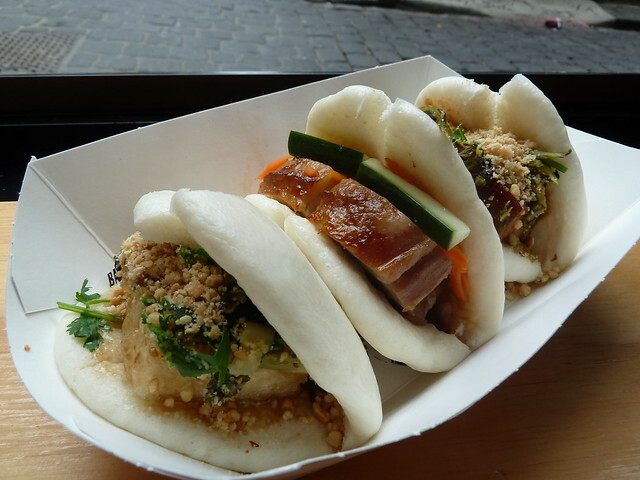 These are Taiwanese-style gua bao, steamed white bread enclosed around fillings to create what could be termed Taiwanese tacos. Wonderbao do three varieties - braised pork belly, roast pork belly and crisp silken tofu, each spiked with different combinations of pickled mustard greens, crushed peanuts and more. 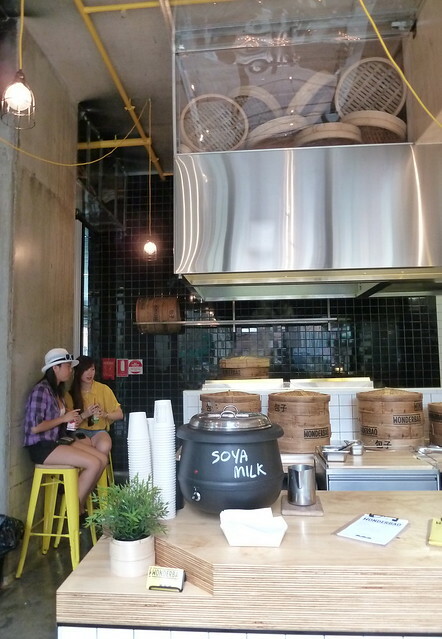 Make sure you get the house-made soy milk too - cooling, sweet and beany. 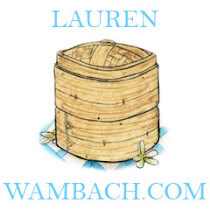 Wonderbao? Wonder-wow! 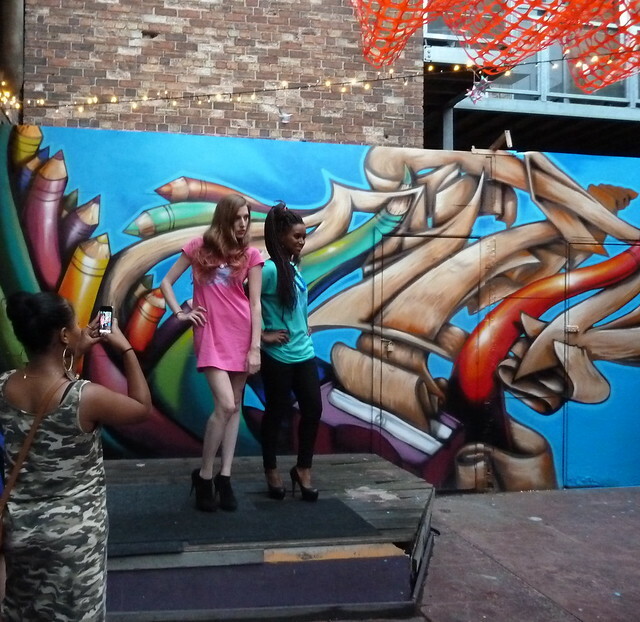 And finally, if you were curious about the top pic in this post, Footscray's new creative hub venue The Colour Box is hosting SELF, or Sustainable Ethical Local Fashion. 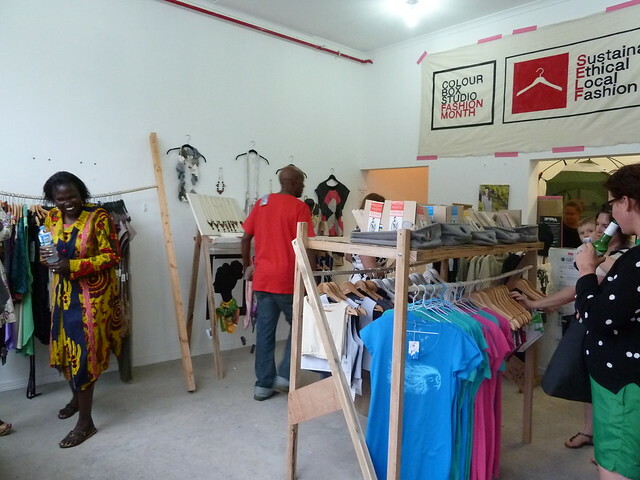 It's a pop-up shop featuring duds by independent designers and cooperatives like New Model Beauty Queen (great name! 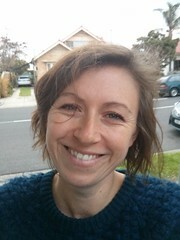 ), The Social Studio, Jude, and Twitch Women's Sewing Collective, a South Sudanese women's group in Dandenong. Read more about Colour Box from its founder, the very inspiring Amie Batalibasi, who not only makes documentary films but also gorgeous bags and badges under her label Pretty WAK. So I might just leave those skinny jeans at the back of the cupboard, get fitted with new duds at Colour Box instead, and keep enjoying life!